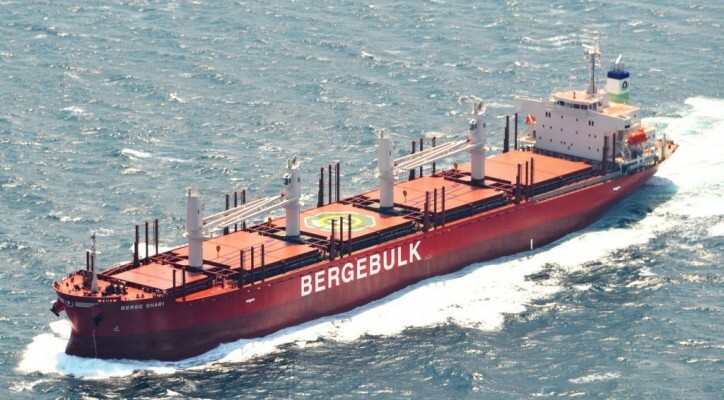 Berge Bulk’s fifth handysize vessel, Berge Shari, was delivered earlier this month (September 16, 2016) from Hakodate Shipyard in Namura, Japan. Sailing under the flag of the Isle of Man, she is the latest 34,000 DWT vessel in Berge Bulk’s ongoing diversification into the handysize market. Berge Shari differentiates herself from her four sister ships by the installation of a PBCF (Propeller Boss Cap Fin), which improves propeller efficiency. This device enables fuel savings of about 0.5% to 2%, and is part of Berge Bulk’s ongoing ‘Bunkers: Less is More’ campaign. She shares this upgrade with her sister vessel Berge Rishiri, which is expected to be delivered in early 2017. She is named after Mount Shari, a Japanese stratovolcano from the Quaternary period, which is located at Hokkaido’s Shiretoko Peninsula and stands at a summit height of 1,547 metres. ‘Shari’, in the Ainu language, translates poetically to “marshes where reeds are growing”.